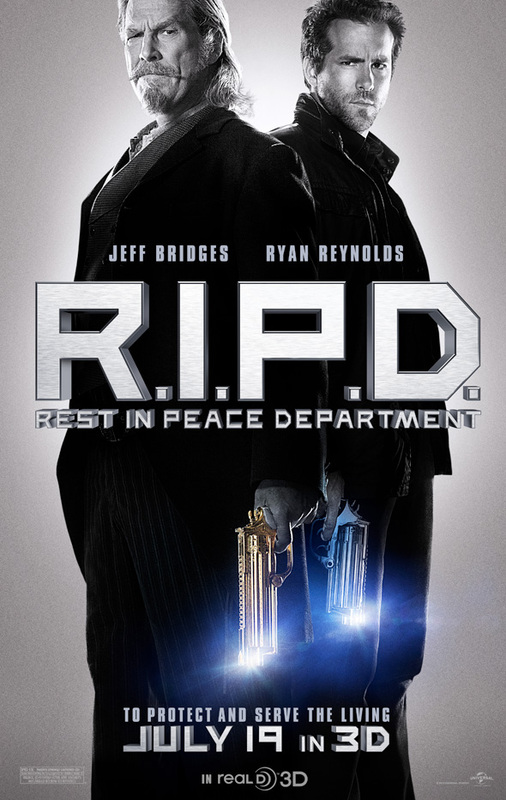 Just last week we got our first look at Jeff Bridges and Ryan Reynolds in the graphic novel adaptation R.I.P.D. from director Robert Schwentke (RED). Now that CinemaCon is in full swing, some of these bigger films getting released later this year are getting a big push into the public eye, and that's where the first poster for R.I.P.D. has been revealed. Much like the first look photo, it highlights the cool guns Reynolds and Bridges carry, which likely have some sort of special powers since they're meant to make sure the dead "rest in peace." We're expecting the first trailer sometime very soon, so stay tuned. Poster below! Robert Schwentke (RED) directs R.I.P.D., written by Matt Manfredi and Phil Hay (Clash of the Titans, Aeon Flux) and based on Peter M. Lenkov's graphic novel of the same name. Nick Walker (Ryan Reynolds) was gunned down in the line of duty at the height of his personal and professional life. Now he's traded 100 years of service to R.I.P.D. (Rest in Peace Department) in exchange for a shot at solving his own murder. Unfortunately, his search will take him to Hell and back with the grizzled Roy Pulsipher (Jeff Bridges) at his side. Kevin Bacon and Mary-Louise Parker also star in the Universal Pictures film arriving on July 19th. ¡Ryan Reynolds as: Ryan Reynolds! Pretty sure this is the only July film that doesn't have a trailer yet. Throw in the rumors about a huge budget, how finishing the effects has been rough because of R&H going bankrupt...and I'm starting to become concerned over whether this is going to be worth a trip to the theater...ESPECIALLY when PACIFIC RIM opens the week before. Ugh. Terrible. I know someone who saw an advanced test screening of this and said it was woeful.